I’ve always had problems with finding the right razor to shave my face properly, maybe you feel the same way too. I did however finally find the right razor for me and that is the Merkur 34C safety razor. If you haven’t used a safety razor I would highly recommend one because they provide for a really great shave. Yet that just created another problem for me, that being that the safety razor didn’t have a cover, would cut up whatever it’s being held in, and would go dull really quickly from touching too many things while on the go. Have you experienced this problem before? I sure have! I figured it was time to get a safety razor sheath to keep it crisp so that’s exactly what I did. A safety razor sheath is a pretty great thing to have in my opinion because they help keep the razor sharp and free of damage while not in use, it keeps my fingers safe, and stops me from having to replace the blades as often too because they don’t get dull from my travel case. This is the most important thing to consider. Some may be made of leather, plastic, rubber, and rarely out of metal. The material will go a long way in determining the efficacy and longevity of both the sheath and your safety razor. You will of course want a safety razor sheath that is the appropriate size for your particular safety razor. The final thing to consider is how the sheath was made. Many are machine made, but a select few are handmade, the handmade ones are always my top choice. 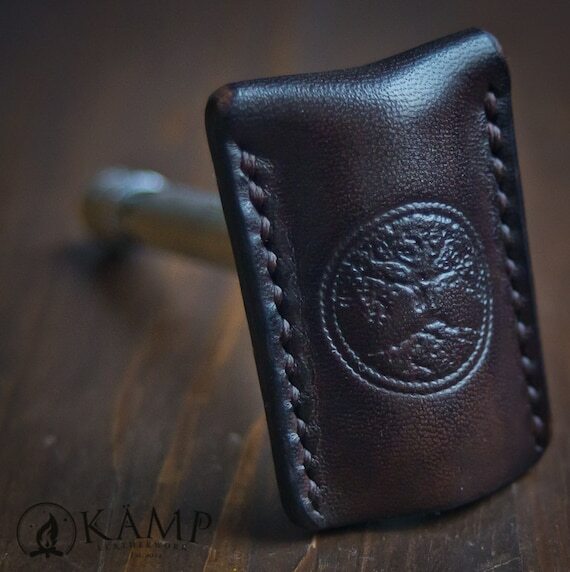 The Kamp Leatherwork Safety Razor Leather Sheath Cover Case is one of the newest released by this brand and it is definitely one of the best. It may not be anything revolutionary or groundbreaking, but it is definitely useful and this particular sheath really manages to do the job without question. It’s a great leather sheath that was lovingly handmade without the use of any factory line machinery so that’s how I know it’s a great product; handmade products are just so much better than assembly line goods! The leather sheath comes in 3 simple pieces that are bound together using ultra-strong waxed nylon thread in order to provide for the perfect fit for safety razors. 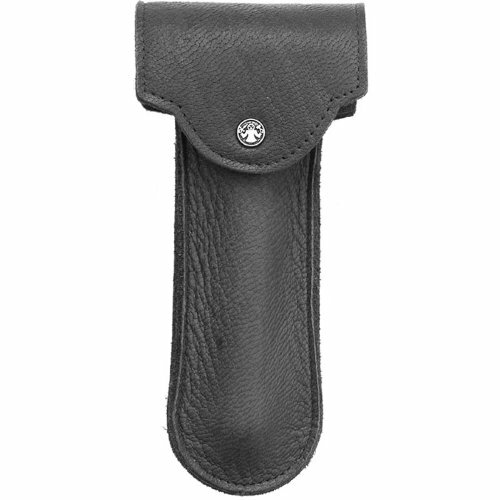 The simple yet unique design of the Kamp Leathework Leather Sheath is very flexible and can thus fit pretty much all standard sized safety razors. Unless your safety razor is absolutely massive this item will do just fine. The strong leather design of the sheath ensures that your safety razor blades won’t end up cutting through it and damaging your carrying case. At the same time the leather sheath also protects the razor blade from outside damage. Having a dull or even damaged safety razor blade can put an end to your shaving and is probably going to hurt a lot, and potentially increase your chances of nicking yourself, but that is a problem which the Kamp Leatherwork seems to solve without question. It’s also great to know that I won’t cut up my fingers when searching through my bag for my safety razor thanks to the layer of material between my fingers and the extra sharp blades. I know that it’s just a leather sheath for a safety razor and it’s something pretty simple, but that being said I have found that there are a great number of benefits that come along with having a sheath for my razor, especially a leather one like this particular model. Let me just talk about some of my very favourite aspects when it comes to the Kamp Leatherwork Safety Razor Sheath. As you will see most of the benefits come from the fact that it is made of leather. I really like the fact that this razor sheath is very simple and straightforward with the whole thing being made out of premium grade leather. The sheath being made out of leather has several benefits which I can think of off the top of my head. One of these benefits is that it doesn’t cause the blade to become dull like some other sheaths may cause. The blade of a safety razor can become dull, nicked, or dented when it is stored and moved without protection, but thanks to the Kamp Leatherwork I haven’t been experiencing that anymore because it offers the optimal amount of storage and travel protection. On that same note, many other sheaths that are made of plastic or metal can still damage the blade because the blade touches it and it ends up dulling due to the hard material of the sheath. The leather is the perfect balance because it is strong enough to ensure that the blade won’t cut through it, but soft enough to ensure that it won’t cause the blade to become dull either. Now when I go to use my safety razor I know that it’s just as sharp as when I put it away. Leather is one of the toughest and strongest materials around, so chances are that the Kamp Leatherwork is the only sheath you will ever need. It is strong and will definitely last for ages; it has lasted me a long time and I’m no gentle guy! The treated leather provides for a great moisture barrier which keeps wetness out and ensures that the razor is perfectly dry when not in use, something that is great for preventing oxidization and rusting. Thanks to the fact that this item is made of leather it is also very flexible. Being flexible is important for a safety razor sheath because it means that virtually all of my razors will fit into it. Thanks to the wax coated nylon binding the sheath is very pliable and will accommodate most sizes and models of safety razors. The nylon binding is both strong and flexible to provide for maximum versatility. Thanks to the natural leather make of the Kamp Leatherwork Safety Razor Sheath it is both sustainable and environmentally friendly; no fossil fuels or environmentally damaging materials involved. The final thing that I am really happy about when it comes to this particular safety razor sheath is that it looks great. The brown leather suits the look of the razor well and it really makes it seem much more sophisticated and rustic. Looking for my safety razor in my big bag of bathroom supplies can be quite dangerous because if I grab the razor the wrong way or run my fingers across it by accident I can end up making a pretty nasty cut, much like searching for a utensil in a drawer full of sharp knives. With this great sheath I can be sure that doesn’t happen anymore because it creates a great barrier between the blade and my fingers. Now for myself the Kamp Leatherwork is definitely my favorite safety razor sheath on the market today, but you may not feel the same way. For that reason I have decided to also list a few alternatives which also make for great sheaths. If my top pick doesn’t work for you then you can always try one of the models I have listed below. This is a good alternative for a few different reasons. Unlike my top pick this one actually covers both the head and the handle which is ideal for protecting the whole razor from top to bottom. Also since the whole razor fits into it I don’t have to worry about the sheath slipping off while not in use, which is also partially thanks to the snap close pressure button that keeps everything in place. Of course like the Kamp Leatherwork this model is also made of premium grade leather, not to mention that it’s about half the price of my top pick. On the other hand, this model is not handmade so I can’t really testify to its ruggedness and toughness, plus the top is not ideal for larger razors either. The top of the Fendrihan does leave the sides of the safety razor exposed which means that it offers slightly less protection than the Kamp Leatherwork. 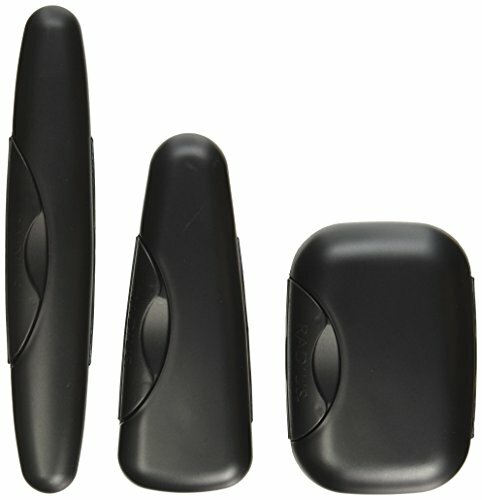 Essentials for every toiletry bag, the set includes 3 pieces with 1 Standard Toothbrush Case, Soap Case, and Razor Case. Quality unbreakable one-piece construction with bacteria and mold resistant design. No drain holes with messy leaks & locking tabs to prevent contents from spilling in travel. Inspected by hand and designed to last. Made in the USA. This is a very simple safety razor case and it does its job just fine. It is made of plastic so it may not be as durable as a leather version because dropping the case may result in cracks, plus the razor on the inside may be damaged as well. Also the Radius Razor case doesn’t securely hold the safety razor in place on the inside which means the blades may still scrape and bang against the plastic, meaning that the blades may become dull with extended use. On the other hand, the Radius Razor case is great because it is completely water proof so you know that it won’t let in moisture and cause oxidization. Perhaps one of the best parts about this particular model is that it is very cheap and won’t cost you more than 5 bucks. Also the Radius does a great job at protecting the whole razor from top to bottom, not to mention that it’s also ideal for cartridge razors too. Merkur is of course a trusted safety razor brand so I couldn’t help listing one of their carrying cases too. This model is made out of plastic which means that it’s probably not as durable as leather cases and may crack or even break when dropped. However the plastic Merkur Case does have special grooves on the inside which keep the safety razor still and stops it from bouncing around and causing damage to the blades. I also really like this case because it fits the whole razor plus it can also fit some spare blades too which makes it perfect for travelling. Being plastic it is also completely waterproof to stop rusting and oxidization. One thing that needs to be said is the Merkur is not ideal for long handled safety razors as they won’t fit because the case itself is fairly short. If you are an avid advocate of safety razors, but are tired of having damaged blades and cut up fingers you would definitely benefit from a good sheath such as the Kamp Leatherwork. In my experience a good sheath or carrying case will stop the blades and even the handle from being damaged, they provide for some good moisture protection, and they also stop me from cutting my fingers when rummaging through my bag. My top pick is of course the Kamp Leatherwork, probably because I just love the leather design of it, but you would do well to pick it or any of the alternatives that I have listed. Shave in style and in comfort with a great safety razor and sheath combination!